My extended family lived on the drug infested borders of Mexico and therefore, I was raised with a horrific aversion to anything pit bull. They were killers, reactive, and deadly to man. One of the weeks I visited there, a young child was killed by an aggressive attack from a pit bull and another a man lost his hand when they couldn't pry the jaws of the pit bull apart from its relentless bite. Imagine my surprise, when I started researching the idea of the "nanny dog" for my next book and uncovered a plethora of pit bull loving ancestors who not only owned them as pets but entrusted them with the protection of their children! They were trained to love the children to the ultimate and became fierce protectors and companions to the little ones who snuggled and cuddled them on a daily basis. And it wasn't just the wealthy who owned pit bull nanny dogs, but the poor over the wealthy often chose the pit bull as the wealthy tended toward the more "good looking" dog that would enhance the visual and not just protect. Oddly enough, the pit bull nanny dog's opposite was the pit bull in the dog fighting ring. Trained in the late 1800's and early 1900's for the ring, pit bulls became some of the fiercest most bet upon dog in the outlawed sport. Solely trained to kill other dogs, these pit bulls were also non-human aggressive. Because of their ability to lock jaw and maintain such a violent death grip, trainers in the dog fighting arena were careful to build the trust and loyalty of the dog, while encouraging its hatred toward its own species. have the drug dog known by me as a child. The pit bull became man's enemy at the hand of man. I still run for my life when a drug-dog enters my cousin's yard. You never know when they're on the attack. Yet, when I visit my Admin Assistant's home, I'm barraged by the fierce loyal love of three engaging and slobbering pit bulls who only reinforce the Victorian age philosophy that no dog can love as much as a pit. 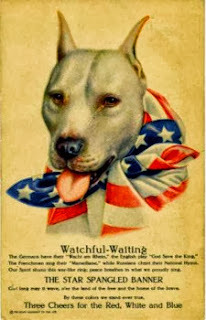 And let's not forget, the pit bull was the mascot of American war recruitment in both World Wars and were even known to be war heroes. 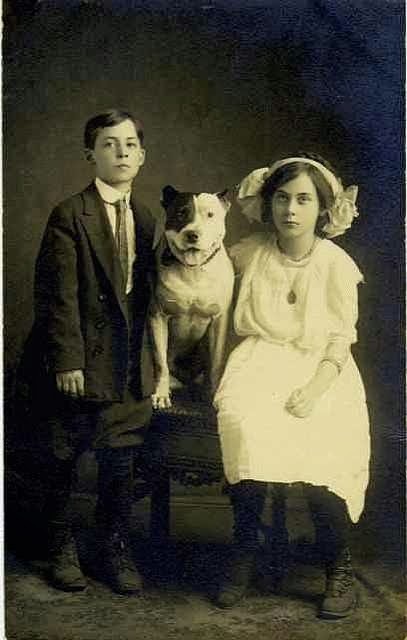 SO as my nanny-dog research continues, I hail the pit bull as a loving and vivacious family dog who, in more cases than not, became the best friends to many a 19th century child. I had never heard that history of the pit bull. I wonder if there were cases where the pit bull attacked the children, as we hear today? Is it really just in the training that they are so ferocious, or is there something inbred in some of them? Very interesting research! Thanks for sharing! I have never heard any history on the pit bull. Your post was very interesting. Another case of not judging a book by its cover! Hi Jaime! I always love the fascinating finds authors discover in their research! I must admit, the thought of a pit bull around my children is frightening! I am glad to know of their loyal and loving history. I look forward to reading your books one day. Your time is coming! I have always feared pit bulls also - because of the things I had heard about them. 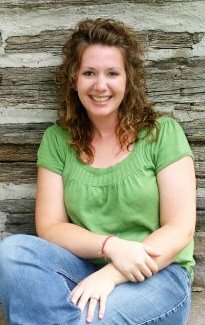 However, my nephew & his family (don't live near me) have several - & swear that they are like big babies, & very loving household pets! Even so - they would never be my choice for a pet. Did you know that Laura Ingall's childhood dog was a pitbull, too? Pitties were very very popular dogs because of their ability to protect the pioneer family. As a dog mom of three, I always love reading a post about pooches! Woof! Wow Jamie! I am like you were, They scare me! What a fascinating post. and it gives me hope for the breed. I've always thought that the meanness was bred into them. So sad what man has done to God's creation. I just don't understand how anyone can enjoy watching one animal try to kill another. My aunt has one that is wonderful ! Totally great with kids. ended up having to be put down as we couldn't trust him with anyone.